my meaning to this song is that life is full of choices and paths, its you yourself that has to not let anything stop you or stand in your way of completing your goals or making a happy life. Life is not like a math book where all the answers should be logical. Believe in myself n lead the life for today is important.Because yesterday is history, tomorrow is mystry and TODAY is a GIFT. first of all it isnt right and well heres like a awsome cheat first u find ur favorite song no youtube then u pause it and make it small then you go to ur fave website then just pop ur fav song then.. I think this means, live how you want to live, don't let people try to tell you how to live. Enjoy everyday that you have here on Earth, because you wont live forever. Actually live. it's ur life .Its my life.we are free in our life. Really energetic n motivation song. I like the song . this is one of my fav songs love it so much!! oh hey Bon Jovi ur in my favorite singers list i hav Evanescence then Adele then Nickelback then u! well thats not in order but oh well. love ths song!!! 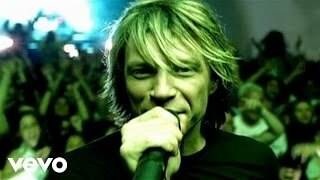 Its one of my best song of bon jovi . Whenever i listen the song it energises me n puffed me with energy n also gives me spirit to do something in life ..